We need representatives that share our values — that’s why we’re talking to neighbors to make that happen. This summer, we’re rolling up our sleeves, knocking doors, and building community. Join us in Omaha, Lincoln and North Platte on July 15 for a Nation Day of Action. 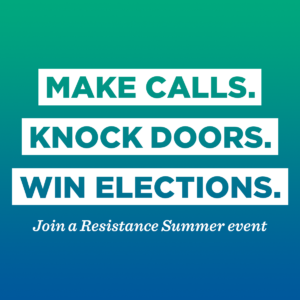 The Nebraska Democratic Party is joining the DNC’s “Resistance Summer National Day of Action” to talk with voters about key issues facing families in rural and urban communities across our state. Volunteers will go door to door to meet and talk with Nebraskans about the issues that are facing them as we get feedback from everyone to rebuild our party and keep Republicans accountable.Volunteers will be trained on how to do the #KnockEveryDoor program that we are piloting in our state to reach voters. The concept behind #KnockEveryDoor is to talk with voters across party lines–Democrats, Republicans, and Independents–to get their feedback and to start building relationships with voters. Lincoln,Bethany Park, 1654 N Cotner Blvd. North Platte,Wild Bill’s Wings & Bowling, 1100 S Jeffers St. VISUAL: Nebraskans talking about important issues and rebuilding the party door to door in rural and urban neighborhoods.